The rise of Inktober lured thousands of artists into sketching with pen. This has always been around but many newer artists are falling in love with ink for the first time. So many books cover the topics of pen & ink work from the basics of sketching to more detailed inking guides for comics. 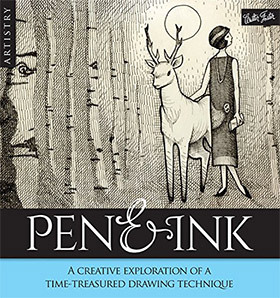 This post covers all the best books you’ll ever want for mastering the art of drawing in pen. Alphonso Dunn is a very well-known artist who runs a YouTube channel full of free videos for artists. These videos cover perspective, form, rendering, and lots of intro videos on the fundamentals of drawing. 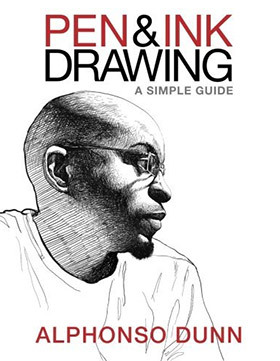 In late 2015 he wrote a book Pen and Ink Drawing: A Simple Guide with 166 pages of detailed guides for beginners. 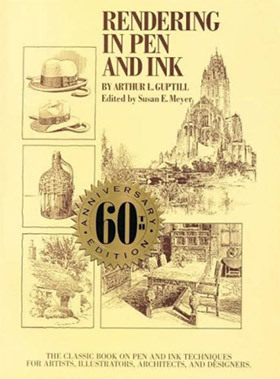 This is perhaps one of the best books on inking you’ll find. Alphonso always encourages his YouTube subscribers to draw with ink because it forces you to make marks and work around them. And this book talks all about the process from line control to fine rendering. Whether you’re an aspiring professional artist or just want to make your own art for fun, this book offers one hell of a journey and it’s a solid introduction to drawing with pen. Here’s a much older book dating back to 1997, yet the drawing techniques are still quite relevant. Drawing in Pen & Ink teaches through examples and clear illustrations. You’ll work through lessons that cover how drawing in ink differs from traditional drawing and why it’s so valuable to the aspiring artist. Each chapter covers different subjects like environments, animals, and common objects around the house. You can work through these lessons using references from the Internet or by going into the “real world” to find them. Any artist can pick up this book and find some value in the writing. But I also wouldn’t call this a definitive guide so it’s worth grabbing Alphonso’s book alongside this one if you’re teaching yourself. The process of inking is very detailed and it covers more than simply staying along the lines. Different types of pen tips write differently so it’s crucial to understand the medium and the techniques involved. 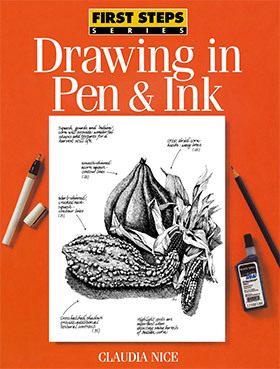 Pen & Ink covers a deeper look into this technique offering expert advice from professionals in the field. Through 114 pages and dozens of practical ideas you’ll learn how to ink artwork and how to do it right. A large handful of professional artists chime in with their suggestions making this information even more valuable. 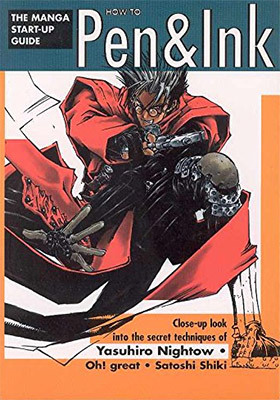 The subtitle of this book makes it seem like a manga drawing resource but these inking tips can apply to more traditional comics or graphic novels too. Definitely an exquisite resource for anyone who loves the traditional medium of inking for comics. Sometimes raw sketching isn’t enough and you’ll want to move into rendering. This is where Rendering in Pen and Ink comes in handy. This book is also a bit older however the lessons really hold up. It’s a massive guide totaling 250+ pages of walkthroughs and tips for artists working in ink. The methods you learn through these exercises all come with tons of visuals so you can study the end result. Cross hatching is a popular choice but you can toy around with other techniques and different paper quality as well. Unfortunately the Kindle edition is not great because of the photo reproduction quality. It’s definitely usable but the print version may work out better if you’ll spend a lot of time staring at the illustrated demos. The blandly-named Pen & Ink Drawing is far from a bland teaching resource. 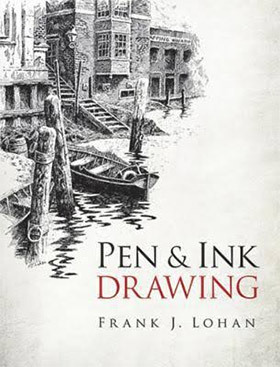 The author Frank Lohan writes about illustration and sketching with ink through his first-hand experience. When you work in pen it’s a whole different ballgame with different rules. Frank discusses these rules and how pen drawing can help solidify new artistic ideas into your mind. Just note this is not a very technical book so it comes with a lot of “copy this, copy that” techniques. You’ll work through lessons sequentially so there isn’t much room for experimentation inbetween. However you should practice on your own anyways and use this guide to help you nail down the fundamentals of drawing with ink. Here’s one other guide on the fundamentals that I absolutely recommend, also written by Frank Lohan. 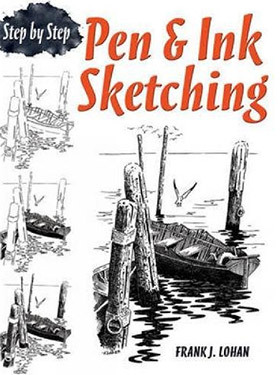 Pen & Ink Sketching: Step By Step offers a clear guide into the world of drawing in ink. Each chapter covers a step-by-step approach to crafting a brilliant piece of art while showcasing the progression of each sketch along the way. In total this book covers 37 unique exercises that you can copy and reuse in your own practice work. The demonstrations may not be directly applicable so you may find yourself skipping a lot of chapters. But I still recommend working through this book even if you don’t have real-world references to draw from. The techniques you’ll learn even working from photos will carry over into your life drawing and your personal work. If there’s any company that knows a thing or two about inking it’s DC Comics. This massive comic book publisher employs thousands of artists with inking experience and many of them share industry insights in this book. 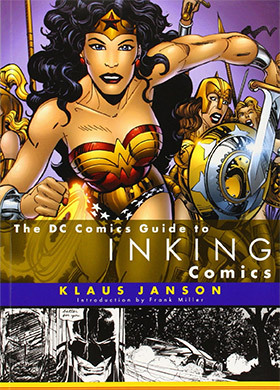 The DC Comics Guide to Inking Comics isn’t really a complete how-to guide. Instead it’s an intro to the topic with some ideas and principles discussed, along with advice from professional inkers. Because this book doesn’t start from the very basics of inking it’s not really great for newbies. You need to have some experience putting ink to paper before you’ll find this book valuable. However if you already do your own comics and want to understand more about DC’s methods then you’ll adore the anecdotes and writing style. It’s also a great read for anyone serious about inking and/or working in comics as a career. For something that’s more geared towards beginners I recommend Art of Comic Book Inking. This is perhaps the absolute #1 guide on learning how to ink step-by-step. It covers all the materials from pens to brushes with a clear divide into two sections: theory and practice. What makes this guide so interesting is how it approaches the idea of inking. You’ll learn what inking is and how it works in the real world, but you’ll also learn how to approach a new inking project from scratch. Plus later chapters cover tips and suggestions written by professional inkers like John Buscema, Jack Kirby, and Gil Kane. 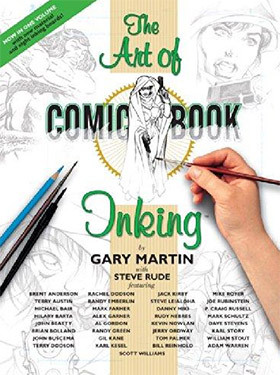 This is a must-own for any comic lovers and for all artists who want to understand inking on a fundamental level. Artistry: Pen & Ink is one of the newest books in this list having first been published in November 2016. It features a handful of artists who share their insights on drawing with pen and using ink as an inspiration for their artwork. Fountain pens, ballpoint pens, brushes, and other materials all make their way into the discussion. Each chapter focuses on a specific artist and a certain subject matter. This offers a truly unique way to learn from many professionals across many disciplines all working in ink. These chapters split 50/50 between inspiring visuals along with practical steps you can follow in your own work. This is yet another must-own resource that I’d say every artist should look into. If you’re even remotely curious to start sketching with ink then Artistry: Pen & Ink offers a beautiful introduction to the subject. Here’s one more new-ish book to add into the list with its first publication in very early 2016. 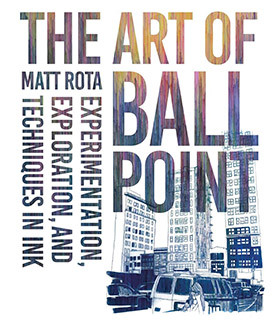 The Art of Ballpoint by Matt Rota explores pen art from a historical perspective. When did it first appear and how has it changed over the decades? Tons of modern ballpoint artists share their thoughts in this book exploring what it means to draw/ink with pen. You’ll find ideas and critiques on classical drawings, graphic artwork, illustrations, and so much more. This is not much of a how-to guide and it won’t teach you how to perform your own pen sketches. But it will get you thinking about the medium and how pens found their way into artistic pieces. All of these books are simply incredible and I do recommend all of them based on whatever piques your interest. But as a general intro I’ll always be a fan of Alphonso’s Pen and Ink Drawing just for the writing style and structure of the book. You can also find some neat guides online if you dig through Google, but there aren’t any free tutorials that match the depth of these books.